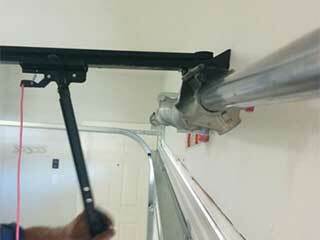 A mechanism as complex as your garage door will gradually begin to break down after a lot of use. These machines go through several cycles of shutting and opening each day, which puts a lot of strain on their hardware parts and wears them out. However, by providing your door with some well-deserved maintenance, you'll be able to extend its working lifespan and its efficiency, as well as reduce the risk of experiencing a malfunction. The regular maintenance service we can offer you will achieve all that and more. Ever since 1993, every automatic door system is required by law to implement safety features that will prevent it from closing while a person or an object are blocking the door's path. Garage door openers are the driving force that powers and controls the system's operation, and they use something called photoelectric sensors in order to prevent this type of accident. These safety sensors are installed at the bottom of the opening, usually attached to the lower parts of the vertical tracks. They work by sending an invisible between each other and alerting the opener whenever something breaks that beam. Misaligned sensors will not be able to do their job properly, and may also cause the door to reverse for no reason. Part of our regular maintenance service appointments is to test this reversal feature and realign the sensors if their position isn't exact. Apart from testing the safety sensors, our technicians will ensure that every other part of the garage door system is working fine. Tracks can also become misaligned, or develop rust and bending. They and the rollers must be examined and potentially even replaced before the door gets off track accident. The door panels will also enjoy a similar treatment. We'll check them for cracks and rust, and apply an appropriate solution to whatever gets uncovered. There shouldn’t be any unusual noise coming from the door when you use it. Seeing as the springs and the cables are in charge of supporting its weight and helping it open and close, any squeaking or other strange noise could mean something is wrong with them. That's why our technicians always inspect these components as well and lubricate and adjust them in order to make sure that their performance remains efficient. If you want to help your door stay functional for as long as it can, and prevent all sorts of accidents and problems from happening, then regular maintenance is the way to go. Contact our team at Garage Door Repair Coral Springs to schedule an appointment today.